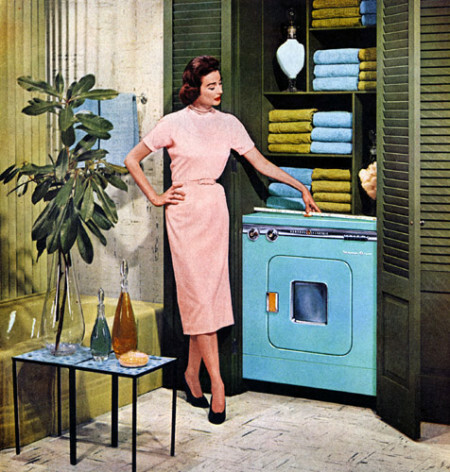 This General Electric Combination Washer-Dryer did double-duty in the mid-to-late-50s. This ad markets one of the popular designs (in teal!). GE invented the first washer-dryer combination in 1954, just seven years after it developed the first fully automatic clothes washer. This model has the dials on the front of the machine – just above the door. This meant it could be easily installed and used beneath a counter (some were installed in kitchens). Other models had dials on top panels (much like a stove). More recognizable in small quarters and apartments today are stacking washers and dryers. The combination machine, though, takes half the space. Combination units are still produced and are actually popular in Europe. Demand for combo units is growing in the US. Of course, retro enthusiasts are more apt to hunt for a ’50s-era machine, even if it requires some repair. From what we can tell, parts for restoration are available, albeit they’re not so easy to find. We’ve not seen many working units from the ’50s (or even a plethora of imagery), but we did stumble across a video on YouTube that features the wash cycle of a 1956 GE combination machine (also in teal! ).